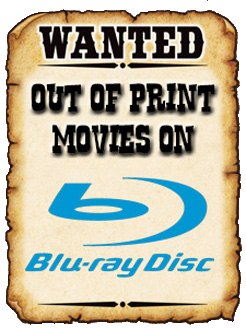 THE B-MOVIE NEWS VAULT: Shout! Factory Proves That You're NEVER TOO YOUNG TO DIE on April 11th! Shout! Factory Proves That You're NEVER TOO YOUNG TO DIE on April 11th! ON APRIL 11TH, JOHN STAMOS BEDS VANITY AND BATTLES GENE SIMMONS IN "NEVER TOO YOUNG TO DIE!" Holy crap! I remember seeing this movie decades ago on VHS and I never thought I would see it get a legit Blu-ray release! Now that it has... I suddenly have the urge to revisit. I wasn't a big fan of it during my first viewing, but that may change once I've had a refresher! Synopsis: When a top secret agent (George Lazenby, ON HER MAJESTY'S SECRET SERVICE) is murdered, his estranged gymnast son Lance Stargrove (John Stamos, Full House) teams up with his dad's seductive and deadly associate, Danja Deering (Vanity, ACTION JACKSON, THE LAST DRAGON) to face his father's killer… the fiendish mastermind Velvet Von Ragner (KISS' very own Gene Simmons.) The hermaphroditic heel is hell-bent on a scheme to poison the city's water supply — and it's up to Stargrove to crush Velvet once and for all! This cult favorite was directed by Gil Bettmann (CRYSTAL HEART, NIGHT VISION) and features Peter Kwong (BIG TROUBLE IN LITTLE CHINA), Robert Englund (A NIGHTMARE ON ELM ST.), and enough leather-clad, mohawked henchmen to fill a dozen ROAD WARRIOR knock-offs. You think you've seen it all? It's never too late to see NEVER TOO YOUNG TO DIE! 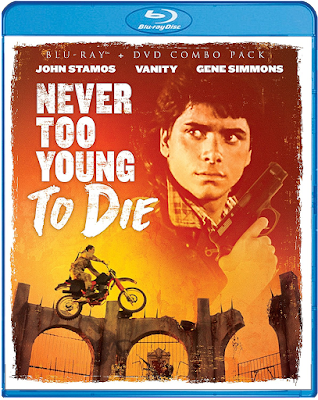 As happy as I am to see this title released to Blu-ray, I am quite shocked that it seems to be a bare bones release, as there's no mention anywhere online about trailers, commentaries, or interviews for NEVER TOO YOUNG TO DIE! Regardless, if you're a diehard fan of this film, then you need to own this Blu-ray/DVD combo pack! It will be available on Tuesday, April 11th, and can be ordered now at AMAZON, BULLMOOSE, DIABOLIK DVD, or directly from SHOUT! FACTORY. VAULT VID-O-RAMA: ALIEN DAY EDITION! On April 11th, Get DEMENTED with Sallee Young!